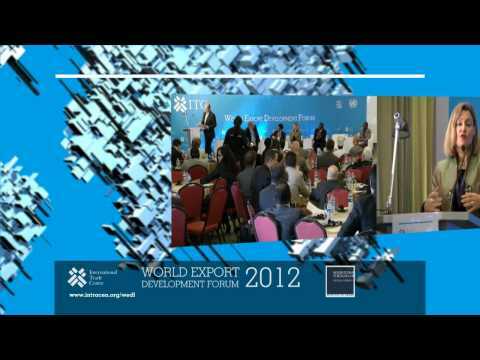 On behalf of the Government of Indonesia, it is my pleasure to provide the closing remarks for this World Export Development Forum 2012. Let me begin by thanking Ms Patricia Francis and our partners for today’s event, the International Trade Centre, for helping us organize this important forum. With the International Trade Centre’s assistance, we have indeed been fortunate in that so many distinguished and knowledgeable guests from around the world have been able to join in the discussions. We have all benefitted from them sharing their thoughts on how to better integrate growth markets into the world economy. I am sure you would all agree that the discussions have been stimulating and that the ideas exchanged can help us all chart a path forward for linking growth markets, not only with developed country economies, but also, perhaps more importantly, with the transition and developing economy members of the ITC. As mentioned by Indonesia’s President H.E President H.E. Susilo Bambang Yudhoyono in his Opening Remarks on Monday, the growth markets of the developing world will continue to gain in significance over the medium-to-long term. This Forum has helped us understand some of the implications of this and how this remarkable growth story can be channeled into inclusive and sustainable development outcomes. Critically, we now appreciate that the levels of inter-connectedness between trading partners are higher than they have ever been. On Monday, delegates began with discussions on the importance of emerging markets and of South-South trade, which had been expanding rapidly. It was noted that much of it is still in intermediate goods, with the final products destined for the North. Building on the opening remarks of the President, three critical factors to intra-regional and inter-regional integration were identified in the first plenary session, namely: improving trade facilitation, addressing non-tariff measures, and making the supporting services competitive. It was recognized that capacity building is crucial and that ITC plays a significant role in this regard. In addition, the Trade Minister of Indonesia highlighted the need for confidence building saying that we need to get to know each other more in order to further advance South-South trade. The importance of trade facilitation was reinforced in the following session which also discussed the broader challenge of connectivity. Here, the three pillars of hardware, software, and people to people linkages were highlighted as necessary components. An interesting issue that emerged during the session is the relationship, or perhaps tension, between industrial policy and the trade agenda particularly of transnational corporations. While it was recognized that enhancing trade facilitation is necessary particularly in the context of global supply chains (or “trade in tasks”), the need to assist countries to move up the value chain was emphasized as well. I think this is very much related to the observation made by the Secretary General of UNCTAD earlier about the risk of developing countries being caught in traditional roles and the need to diversify, address NTMs, and to frame appropriate investment policies in different ways. The parallel sessions and the general session on Indonesia’s MP3EI provided the opportunity to discuss the issues and challenges as experienced on the ground. I think that these sessions are most informative and provide the best opportunity to learn from each other. Private sector concerns in having clear regulatory frameworks and criteria for project selection in PPP schemes, simplifying administrative procedures, assistance in complying with NTMs, freedom of data movement and internet access for SMEs, and anti-competitive practices in telecommunications services were examples of excellent feedback from the private sector which we in government should be aware of and address. On the second day, the Forum started with a focus on the role of trade and commodity supply chains in achieving food security. We got the perspective from countries of diverse sizes and, just like in the sessions the day before, we also looked at public-private roles. There was an appreciation of the need to better integrate supporting services into commodity supply chains and facilitate greater engagement with smallholder producers and small and medium sized enterprises. Discussions were productive and led to practical suggestions with which to improve supply chains not only for the purposes of trade, but also for greater regional and global food security as well as food safety. Sharing research results and market information, regular dialogue with all stakeholders, and reducing cost margins by removing transport bottlenecks were some of the ideas exchanged. With an enhanced understanding of supply chain weaknesses and opportunities, decision makers gathered here for this important forum will be better placed to tailor policy and regulatory frameworks. Another important issue that drew attention on day two was the need for many developing and least developed countries to move their exports up the value-chain. We noted that it is still unfortunate that the export composition of many developing and least developed countries (LDCs) is still dominated by low-value-added, raw materials. The parallel sessions that followed looked into how the small producers, SMEs, and other actors could benefit from innovative approaches, communications and adapted traditional technologies as well as support services. Problems and the solutions range from the relatively simple (e.g, identifying sources of market information and the support institutions who can help you) to the more complex (e.g. development of high-tech IT platforms for commodities exchanges). From the various discussions we can see that there is clearly a role for the government to fix market failures and address missing markets but it is also important to recognize and manage government failures by improving coordination (say, among trade and tourism promotion offices), simplifying procedures, reducing burdensome requirements, and other regulatory impediments. Over the course of the last two and half days, the forum also examined many other important issues, such as how to promote services exports, how to increase participation in government and corporate procurement for women business owners and how to improve access to finance for emerging market exporters, especially SMEs. These discussions all contributed to an enhanced understanding of how policy makers need to craft and implement policies, with input from the private sector and civil society, on how to channel the dynamism of the growth markets for the benefit of our people. In this regard, an emerging theme that cut across all the discussions of the forum was an acknowledgement that developing and transition economies need to find our own solutions to building networks and encouraging South-South trade. I sincerely hope that delegates have found the discussions stimulating and thought provoking. No doubt new insights and innovative ideas have emerged. The challenge now is to translate our deliberations into concrete initiatives and partnerships. For our part, the Government of Indonesia will continue to engage various stakeholders in developing policy and strategy. I encourage all of you to work with your respective governments to do the same. I thank you for your attendance at this World Export Development Forum and wish you all well in taking the next steps to linking growth markets and ensuring the new dynamics in international trade deliver outcomes that are beneficial to us all.